Interstate 70 stretches from Hancock and the Pennsylvania state line to Interstate 695 and the city of Baltimore. Originally I-70 partitioned into the branches of Interstate 70S and Interstate 70N from Frederick eastward. Interstate 70S followed today&apos:s I-270 while Interstate 70N followed the present day I-70 mainline. Within Maryland, Interstate 70 supplemented or directly overlaid the U.S. 40 corridor from Baltimore west to Hancock. This includes the stretch from Exit 82 west to Exit 59, which opened in 1970 as I-70N. Two alignments were planned for Interstate 70 through the city of Baltimore. 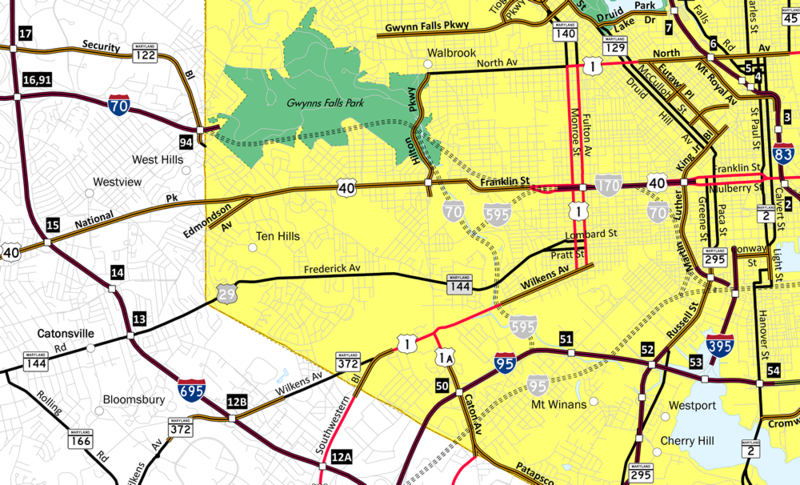 Traveling east through Gwynns Falls Park, the first projection of Interstate 70N merged with the U.S. 40 corridor before turning south to end at the proposed alignment of Interstate 95 near the Baltimore Ravens stadium. Changes were made later to shift Interstate 70N more southeasterly to include a freeway spur (Interstate 170) along the U.S. 40 corridor and an end at Interstate 95 east of Caton Avenue. Community opposition stopped construction east into Gwynns Falls and Leakin Parks. A section of freeway opened between the one-way street couplet of U.S. 40 as Interstate 170, and ramp stubs were built from Interstate 95 at Exit 51. A final proposal focused on adding a spur along parts of the Interstate 70 path from I-95 northwest to the I-170 spur. Had this been constructed, the arcing spur would have been designated Interstate 595. Monocacy Boulevard connects Maryland 144 (East Patrick Street) and Frederick Municipal Airport with Interstate 70 & U.S. 40 westbound in Frederick. Monocacy Boulevard and South Street see a folded diamond interchange with the freeway (Exit 55), east of the merge with Interstate 270. Photo taken 12/30/08. Maryland 27, which originates at Interstate 270 Exit 16 and heads north via Ridge Road through northwestern Montgomery County before entering Frederick County and meeting Interstate 70 in Mount Airy. It intersects Interstate 70 and U.S. 40 at Exit 68 at a high speed interchange befitting a connection from a divided highway to an Interstate highway. This photo shows that intersection as seen from northbound Maryland 27 at Interstate 70 & U.S. 40. From this interchange, Maryland 27 continues northeast as a rural highway to Westminster (Maryland 140) and ultimately Manchester (Maryland 30). Photo taken 06/01/03. Ingleside Avenue lines the northwest quadrant of the interchange between Interstate 70 and Maryland 122 (Security Boulevard). The surface street doubles as the access route from Security Boulevard to Interstate 70 west in this role. Parallel Drive exits the Social Security Administration complex to end at Ingleside Avenue ahead of the freeway ramp. Drivers taking Parallel Drive see an independent ramp to Interstate 70 of Ingleside Avenue as well. Photos taken 07/02/10. Heading east on Ingleside Avenue from the West Hills neighborhood to Interstate 70 west. An original button copy sign alluded to the previous designation of Interstate 70 as Interstate 70N. The button copy numbers for 7 and 0 were repositioned when the letter N was removed. Photos taken 06/20/12.